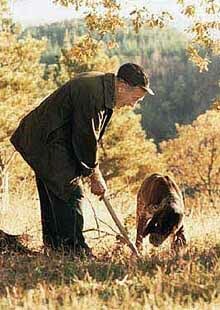 Venturing in the mysterious world of truffles, one discovers a complex system of fragile equilibriums, and of exclusive relationships linking truffles to the plants from which they feed until their peculiar stench attracts wild boars or insects, snails or dogs (trained by men). 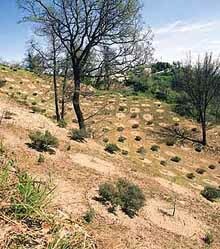 When these animals feed on truffles (or pick them), they disperse the impalpable spores, thus starting a new life cycle. 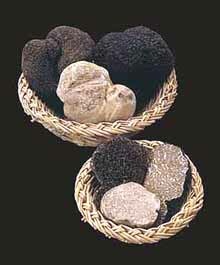 Truffle varieties include the small black truffles (found in winter time), the bianchetto truffles (smooth truffles), the black truffles found in summer time, the excellent smooth black truffle and the ordinary black truffles. In October the most sought-after and expensive truffle variety can be found; the large and golden valuable white truffles. It is also worth mentioning the tartufi uncinati (hook-like truffles), the tartufi moscati (muscat truffles) and the sweet valuable black truffles, which conclude excellently a year full of precious scents and products. In small towns such as Acqualagna, Amandola, Sant’Angelo in Vado and Visso truffles may be found in every season, during exhibitions and in shops selling foodstuffs and typical products. Truffles are both available as they are picked, or processed into truffle-scented oils, soft truffle pastes, or savoury sauces. They are usually displayed like jewels, and their prices are often similar to jewels’, or they are served in restaurants as the main ingredient in many dishes. 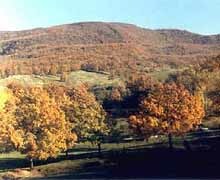 The National Fair of White Truffle (in late October, early November) and the Regional Fairs of Valuable Black Truffle (in late February) and the Summer Fair of Black Truffle (on 15th August) in Acqualagna, are among the most important exhibitions in Italy, along with the autumn National Fair of Agricultural, Wood and Shepherds’ products in Sant’Agata Feltria. Some companies have recently specialized in truffle cultivation (for example in Roccafluvione), while the truffles from the Marches are now being sold on the Internet, increasing their notoriety thanks to e-commerce.